Who's to blame for high home prices? Who’s to blame for high home prices? The Trudeau government is doin’ alright, according to the Organization for Economic Co-operation and Development (OECD). Their decision and action to boost the economy through infrastructure spending is considered to be a wise call. But now the Liberals need to turn their attention to the elephant in the room: the residential housing market. At least, this is the nice, neat version of the most recent OECD report; a 160-page analysis of how Canada is faring in this current sluggish global economy. OECD applauded our newly elected government for their initiatives to boost economic growth through infrastructure spending. That’s good. But overheated pockets within the residential housing market? That’s bad. This isn’t the first time analysts tried to warn us of an impending collapse of two potential housing bubbles in Canada. Add to this list: the International Monetary Fund, Fitch Ratings, at least two prior OECD reports, an Economist magazine roundtable, the list goes on. Canadian existing home sales slipped 2.8% in May (seasonally adjusted), leaving activity a still-firm 9.6% above year-ago levels and just down from a record high. Supply, however, remains extremely tight, with new listings falling 3.2% in the month, or 4.1% in the past year. That left the months’ supply of homes available on the market steady at 4.7, the lowest since January 2010 (i.e., when demand was surging out of the recession). That combination continues to push prices higher, especially in the country’s two hottest markets. The average Canadian transaction price was up 13.2% year-over-year in May, while the benchmark price rose 12.5%year-over-year, the strongest clip since 2007. But, as you are by now well aware, this is entirely a two-city story, with benchmark prices in Vancouver flaring 29.7%year-over-year in the month (including a nosebleed-inducing 37% year-over-year rise in detached homes), while Toronto prices are up 15% year-over-year. 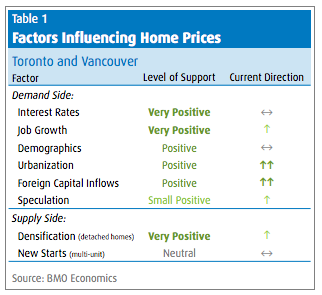 According to BMO Chief Economist, Douglas Porter, and Senior Economist, Robert Kavcic, there are a handful of factors that directly or indirectly impact real estate prices in Toronto and Vancouver. In an effort to appreciate how each factor impacts housing, Porter and Kavcic examined and rated each factor to assess the impact it had on Canada’s residential housing market. By assessing each factor, Porter and Kavcic developed an appreciation for which factor has had the most impact on Canada’s residential housing trends. 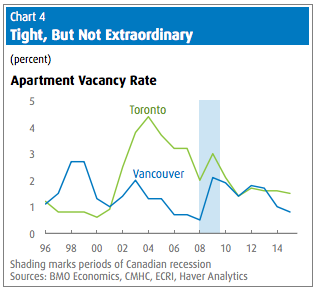 Want to know why housing demand is so high in Vancouver and Toronto? Look at the job stats. According to Porter and Kavcic, B.C. and Ontario are “poised to lead the country in economic growth again this year.” Their strong economic performance has meant job growth. “These two cities have accounted for all of Canada’s net job growth in the past year,” write the report authors (the emphasis is mine). 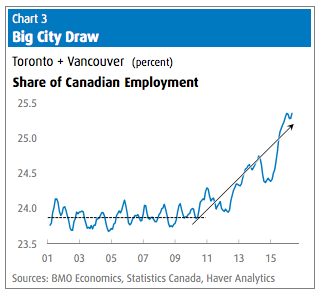 While the rest of the country were losing jobs, Toronto and Vancouver added positions. Meaning that these two cities now account for more than 25% of all Canadian jobs—”the highest share in at least of 15 years of data,” notes the report authors. With roughly 250,000 more jobs in these two cities that’s a strong marginal boost to housing demand. There’s one demographic cohort that drives home buying and before you answer, it’s not the Baby Boomers, although they do play a role. Regardless of the year or cohort, the prime home-buying age group are the 25 to 40 year-olds. After a 15-year lull this prime home-buying cohort started to really accelerate their purchases beginning about 10 years ago. “Quite simply, the millennials have now more than filled the housing demand void that plagued the country and helped suppress home prices through the 1990s/early-2000s,” write the report authors. But what really set the housing market up for such great gains wasn’t just the buying habits of family-making millennials, it was the selling habit of Baby Boomers. Over a decade ago there were predictions of falling home prices, as Boomers abandoned their single family detached homes and downsized. But that just didn’t happen. So now you have baby-making millennials trying to buy from staying-put Boomers. Less supply plus increased demand means historical housing prices, particularly in Toronto and Vancouver. Two cities making up more than a quarter of jobs within Canada means that urbanization plays a role in the housing market prices. “The shifting nature of the domestic economy continues to favour a push into Canada’s largest cities,” write the report authors. 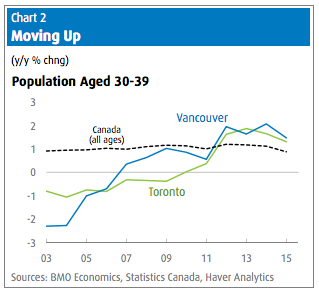 The loss of manufacturing jobs and a weak resource sector has driven younger people into the big cities in search of employment. This has resulted in higher rental rates, as vacancy rates drop which, in turn, impacts housing market demand. And Vancouver’s homes haven’t been the only recipient of the excess global surplus of cash. “Many asset prices rocket[ed] higher in recent years—bonds, commercial real estate, infrastructure, private equity, residential real estate in Manhattan and London…” to name a few. The real concern, according to Porter and Kavcic, are condo-speculators. They question whether the year-over-year price increases for condos—currently at 22% in Vancouver—is the peak of the curve. “The fact that condo prices in [Vancouver], which don’t share the same supply constraints as the detached market, are going parabolic suggests that price growth might be starting to reinforce itself.” In other words, speculators have now reached the euphoric state of buying: getting into an ever-increasing market, at whatever cost. The good news, for Toronto condo-owners, is that Toronto “is a far milder case” when it comes to condo-speculation. Suddenly, lack of supply is the No. 1 reason for high housing prices. But as Kavcic and Porter point out: “it was only a few short years ago that the single biggest supposed sign of Canada’s housing bubble was the “rampant overbuilding” in Toronto’s condo market.” Apparently, we can’t quite get the formula right. Overbuilding one year. Under-building the next. Too many condos. Not enough single-family detached homes. “The reality is that overall home building has been relatively healthy in the two big cities, and broadly in line with demographic demand—for example, vacancy rates have held relatively stable at fairly tight levels. Of course, there has been an imbalance between the new supply of condos and detached homes, but that would explain why relative home prices would shift, not why the whole structure of prices would ratchet higher,” write Porter and Kavcic. So that leads us to the issue of land restrictions and densification. “The composition of [the housing supply] is playing an increasing role in driving detached-home price gains. In a nutshell, while demand for single-detached homes has been rising at a brisk pace, supply of those homes has become almost irresponsive.” Turns out the number of detached homes in Vancouver has hardly budged in two decades, and in Toronto, the number of single detached units completed in 2015 was the lowest since 1979, according to the BMO report. While Vancouver can truly plead a land shortage, it’s Toronto’s push for densification—a push that dates back decades—that is the reason why we are witnessing the end of single-family homes being built on 50-foot lots in the city. So, what’s a policymaker to do? Realize that there is no one-stop, broadsword fix to this problem. But that doesn’t mean ignore the problem. More and more the option to impose a tax is looking good. Whether it’s a foreign buyer’s tax or a tax on capital gains above a certain threshold or a tax on flipped properties, or a combination of all three. At least if we de-incentivize parking money or making quick money with Canadian real estate then you can chase out most of the marginal buyers and leave the family-builders and homeowners to get on with building communities.